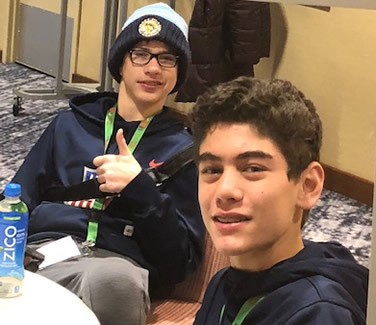 More than two dozen Middle School students in the Bullis Emerging Leaders Academy, a leadership skill-building and community service group, attended the LEAD conference in Crystal City, VA. There, along with four Bullis Upper School students, they met other student leaders and heard motivational keynotes from several leadership experts. They also had the opportunity to participate in small group workshops designed to help students grow their leadership skills; improve the function of student governments; prepare students for next steps like college and career; and develop and shift school culture in a positive direction through spirit weeks, anti-bullying, global citizenship, and community service. Over the course of the two-day conference, Middle School Emerging Leaders Academy students enjoyed an immersive learning experience, shared with over 1200 students from across the country. The LEAD Conference dovetails with the goals and work of the Emerging Leadership Academy. Open to rising 7th- and 8th-grade students, participants in the Emerging Leaders Academy begin with an intensive 3-day leadership retreat in August. In preparation, students read books on leadership, specifically what it means to be an ethical, positive, servant leader. Over the course of the retreat, students then engage in creative activities designed to apply the lessons found in the books to their lives as middle school students. Among the books the students read this year was The Energy Bus for Kids, by Jon Gordon and Peaks and Valleys, by Spencer Johnson. Bullis Middle School provides this opportunity to students to help build skills that will serve them in high school, college, and beyond. In April, Emerging Leadership Academy students will participate in a trip to the Weinberg Center in Frederick, Maryland and a community service event on campus. Students who've participated in the Emerging Leaders Academy say it gave them a sense of community and courage to lead with confidence and humility while standing up for what they believe in.